Who would have thought that a film about a hitman getting revenge for the death of his dog would bring us such an entertaining franchise. From the action to the aesthetics of this world – I mean, have you seen the Continental Hotel and what these assassins wear – the world of John Wick is one that continues to expand with each new installment and I for one love the chance to explore each and every corner of it. But John Wick: Chapter 2 was somewhat of a step down from the first. Still, it was nice to see that even though it couldn’t sustain that momentum, it still had high-quality action. So it looks like Chapter 3 will be somewhat of a redemption as it looks like things are about to get even crazier. And that’s a good thing. Especially for a franchise that thrives on stylish action and very cool fashion. The film also stars Halle Berry, Laurence Fishburne, Mark Dacascos, Asia Kate Dillon, Lance Reddick, Saïd Taghmaoui, Jerome Flynn, Jason Mantzoukas, Tobias Segal, Boban Marjanovic, with Anjelica Huston, and Ian McShane. 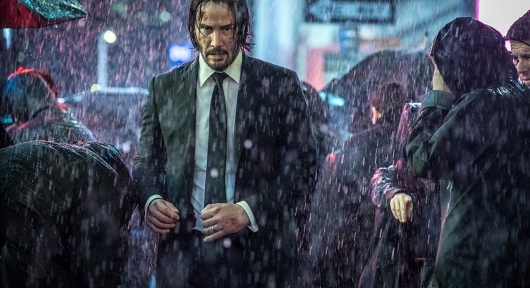 Directed by Chad Stahelski, John Wick: Chapter 3 – Parabellum opens in theaters on May 17, 2019.